The entrance gate is located at the northwest corner of the Reserve, with the camping area located approximately 1/8 mile to the south along the western edge. A fence runs south from the gate, next to the campground, and terminates just beyond the campground. The western boundary continues in line with this fence, just to the east of the 4307-ft Pico Lobo. 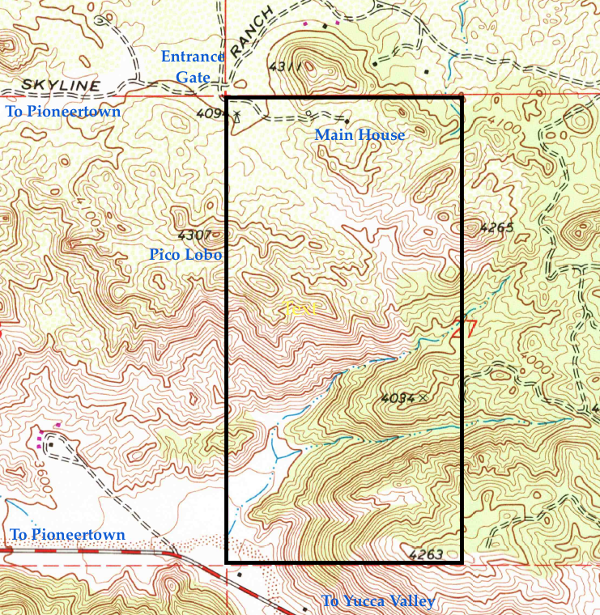 The southwest corner of the reserve is located in the wash that is visible driving north on Pioneertown Road from Yucca Valley. The northeast corner of the reserve is about ¼ mile east of the Main House and it is requested that visitors refrain from using this area of the reserve without consent of the reserve manager or steward. The southeast reserve corner is just beyond the 4263-ft peak.